My wife's Auris had a puncture repair a few weeks ago. 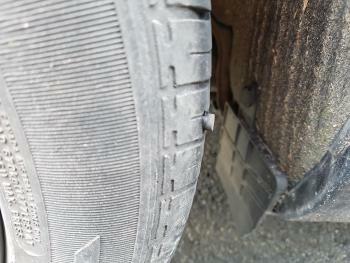 I went to double check the tyre pressure again today, and noticed this strange (rubber) thing sticking out of the tyre. I gave it a gentle tug, and it seems stuck pretty fast, but I don't want to yank it in case it leaves a hole in the tyre!!! Is it something to do with the puncture repair (e.g. from where the nail/screw was removed)? Is it the tyre failing? Is it something to worry about, or is it normal? May be the outer end of the plug used to repair the tyre. If so, not a very tidy repair. Is this normal, or is she going to need to take it back to the garage? 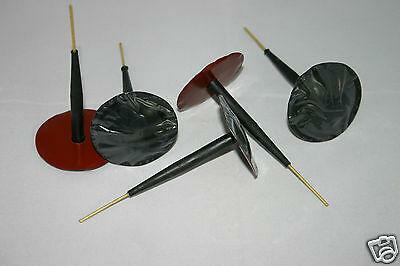 But, I thought these could not be used close to the tyre sidewall as per the picture. To repair these 'difficult' areas, if they can be fixed at all, usually needs the tyre to go to a specialist repairer, at a greater cost. Or at least that's what happened when I had one repaired some years ago. 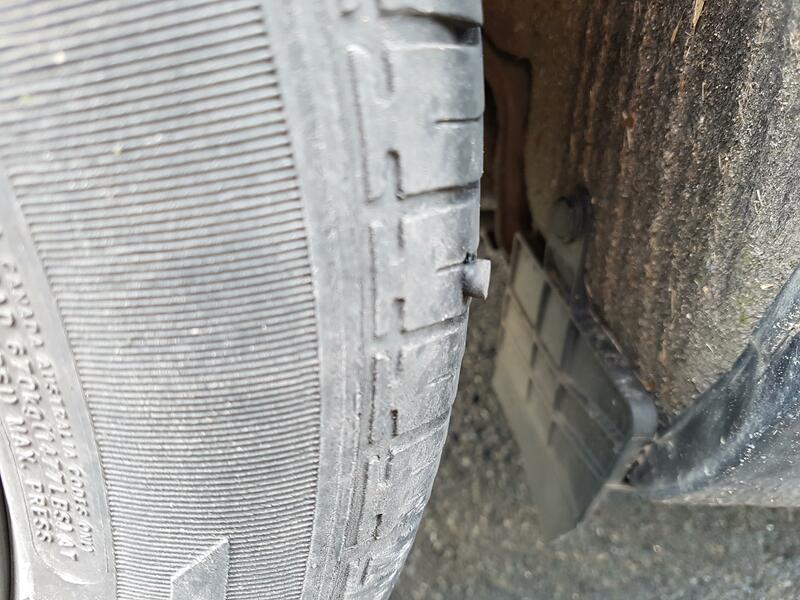 But a repair that close to the edge of the tread was usually a no-no. Perhaps someone knows the 'best practice' or regulations on this? The sidewalls are not fixable, but your's is borderline between sidewall and threading, but goes more towards the thread area. That plug is called a mushroom plug, and it's often used, i guess they thought it would just be worn with the thread fast, and not bothered to cut it. Just trim it down to be flush with tire, and should be fine. I do not think that is a legal repair? Too close to side wall and should be vulcanised? was it done by a proper tyre company? Try checking with a printed out gauge - see link. Thanks for link. I'll try with that, and report back. I've just looked up the receipts given to me when we bought the car, and it looks like the tyre was put on 5.5 years ago, and is only an Evergreen - so I guess not the end of the world if we need to replace it. I worked in the tyre industry years ago and they leave that extra bit so that it will wear down to the level of the tread of the tyre. 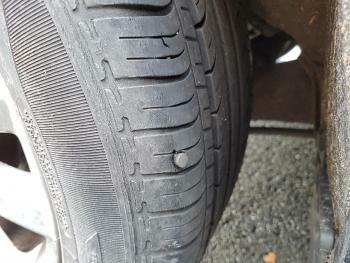 A repair that close to the sidewall wasn’t allowed when I was doing tyres, the repair plug needs to flex and as someone said there is no flex in the sidewall. Things might of changed by now but I’d defiantly take it to another garage for a second opinion. Hi, I have repaired 100's of tyres, everything everybody has said is correct. I do not like that repair, what's your spare like, if the spare is good then swop it over, if the spare is all but worn out I suggest 2 new tyres if your pockets are deep enough.